Convenient and lightweight compact design provides weighing capability anywhere. The Weigh-Tronix PB500 offers a convenient, compact and portable weighing capability. 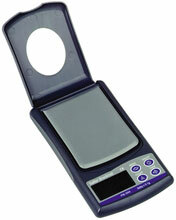 This elegant looking product offers unparalleled weighing performance, with the advantage of low cost and affordability. Standard features include grams, ounces, pennyweights and troy ounce weighing modes, parts counting and auto power off to enhance battery life. Offered in a stylish and tough ABS case with a useful top plate cover that protects the weighing platform from accidental damage, while doubling as a draft shield for more accurate weighing. Batteries and a multilingual user instruction manual are included.